There’s another white dual cab propped on the wrong side of the road. I wind down the passenger’s window to ask if all’s OK. A khaki-clad man pauses, narrow-eyed and hesitant way out here, water bottle pulled from an open, dust-laden tailgate. We’re in Namibia – previously German South-West Africa – the Namib Desert straddling the entire 2000km western coast but never more than 200km wide. “Yah, the oldest desert in the world”. Karl’s a geologist, and nods his hatted head, the only other soul we’ve seen today. “For sure, this is true, there are not too many coming this way.” He’s slammed the fridge shut and tucked the bottle in a bulging side pocket, his sleeveless jacket the type favoured by well-off German tourists here; vest pockets full of pens and battered notebook, the back of those hands red from a searing yellow sun. I look past the geologist, to a flat and looming redness, then back to a worn moonscape skyline, and our distant dust trail that somehow hangs in limbo. The words “wet and cold” some alien notion, all around an engulfing, sweltering silence; the only obvious living thing, an occasional 2000yr old oddity of a prehistoric plant with two lonely leaves invariably shredded by Namib dust devils. The air conditioning hums, Karl’s dual cab just a speck in the rearview, endless straight ahead, daunting hot and harsh: Spartan but sublime. How much difference could another 80km to the coast possibly make? Desert flats are sand, and scattered dolomite pebbles polished black by wind-born grit; way ahead a floating mirage, the imaginings of distant shimmering dunes shrouding a somewhere shoreline. The sky’s turned grey: a faded waterless wash, the road morphing to curves that blend and drift; some strange netherland not sand nor sea. At Terrace Bay we finally stop, wash off dust, don jackets and bathe in cool sunset air while sitting on a raised concrete porch drinking hot mugs of rooibis tea. The sun’s long gone, the sky still grey – the horizon too – the incessant boom on a steep beach, pounded by constant crashing waves. 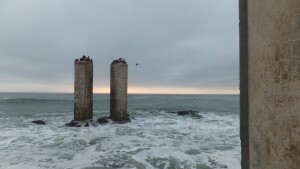 Morning sees giant concrete pylons emerge from mist, once supporting a giant pipe with water for washing precious stones: what’s left of an Onassis diamond mine; these 10m towers the skyscraper homes to black cormorant clusters, safe from wild Atlantic seas. Beady eyes stare, snake-like necks craning to take in our every move, our boots slipping on wet rocks and black, broken kelp. It’s not difficult to imagine past hardships here, the failed dreams and lost lives, the bones of forgotten mines and over 100 ships that litter a desolate coast: beached skeletons the wrecks of stranded wooden whales, casualties of an eerie phantom mist. I turn my back to the Atlantic, and the cold air of a freezing Humbolt current, gazing east to the dunes, imagining shipwrecked sailors and the certain ordeal of trudging lost through endless dunes to perish in the Namib furnace from where we’ve come. In the restaurant, I dine on tender oryx steak; my girlfriend, on linguini and garlic mussels, while the mechanic fixes our shredded tyre. The maitre’d wears a crisp white shirt and cowboy boots, restaurant walls covered with graffitied comments of adventurers from around the world; the wine a perfumed Stellenbosch Pinotage, the music Marley, Phil Collins and UB-40. At the workshed, Josh’s impressed at anyone driving all day from the giant Etosha salt pan up north. “And you saw lions?” It’s late, with Josh now under the bonnet of a Mercedes truck as I relate an encounter with 2-lionesses refusing to move from the road in front of our car. He shakes his head. I’m taken aback, not sure what to make of the now talkative Josh and the unexpected disclosure. I look around: the desolation and giant dunes, the great Atlantic sweep. Josh takes my point and smiles. “A lone male tagged with a radio collar.” Josh leans against our dual cab, balancing the pump in the crook of his arm. “Yes, he sometimes comes by. But we get little warning. It is kept a secret until the rangers, they ring us. He visits local waterholes. You would have certainly passed them when coming here.” Water holes here? I make a mental note. Josh left the capital of Windhoek when still a kid; having high hopes of studying zoology in Johannesburg. There’s a wan smile on that black face. He did time in the mines and drifted to odd jobs and truck repairs. I’ve seen oryx up north; the country’s emblematic second largest antelope and a living cave painting; a dangerous option for a lion, being sometimes impaled on those sharp spear-like horns. But it seems there are other dangers for a lion. Even more recently, there’d been one animal – collared like Josh’s lion – killed by a trophy hunter, then another shot shortly after, the fate of that small desert pride sealed with the death of the remaining two: sisters poisoned with strychnine. Crashing waves drown the whirr of a distant helicopter: a silent north-bound speck high above, heading for a newly-built airstrip; the frontline in the Namibian search for oil and offshore gas. “We are a small nation of only 2-million….so we need this. It is for the future.” Josh’s voice lacks conviction. Heading south we see the waterholes just off the road; secret reed-bound, oasis oddities and patches of parched grass; Atlantic to the west, endless dunes to the north, south and east. Flamingos stand on shining pink ponds: spindly stilted legs among silent mirrored brethren. Not 20m from where we stand, an oryx drinks, raising painted head to stare, rapier-sharp horns held high, sniffs the air and heads off, slowly turning for one last look from atop a dune. Today the king is nowhere to be seen. Ian, another excellent post that makes me want to visit lands I’ve never seen! Such beauty to the incredible insolation there. Amazing how that prehistoric looking plant grows where nothing else will grow in that terrain. Looking at it in an enlarged view, I can see the little star-shaped flowers. It seems a lovely yet lonely plant, and perhaps that applies to life in those places as well. “It’s not difficult to imagine past hardships here, the failed dreams and lost lives,” indeed. Nice description of the restaurant where you and your girlfriend ate dinner (good music too). Josh’s tale of the desert lion was fascinating. I’ve never heard of a lion on a beach but that would be a rare and wonderful sighting. Thank you for this amazing glimpse of Namibia. Your vivid narrative brings it all to life. Those plants really are something else Madilyn… some growing surprisingly large. Wow, the life you’ve lived — the life you’re living! I love the way you paint pictures. You manage to make the bleakest terrain look colorful. I’ve never been to Africa but would absolutely love to go. Thanks for the story! Funny… I am quite @ home among that `bleak’ vastness; with southern Africa similar to Australia in so many ways. Ian, I love in your writing how the primitive and primordial are always lurking behind the thin veneer of civilization. My hope is that our lion friend will still be roaming his vast desert terrain long after all the pylons and automobiles have disintegrated. I guess I am comfortable with the notion of any overwhelming vastness, & the `temporary’ influence of the human race. An awe inspiring landscape, brought to life worth your usual descriptive flair. Wonderful, thanks. Certainly a vast & inspiring place. Poetic as ever, old chap. Do lions get lonely, I wonder? Or is he happy in his own vast, empty space. Lonely? Maybe. Certainly a wanderer. Ian, I had no idea that lions could live in the desert, or that diamonds were once mined there. 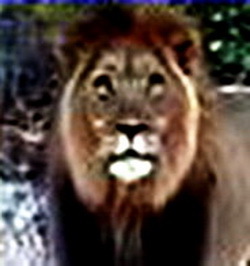 Very sad about the lion pride being killed, but it’s nice to know the Lion King still swims and roams. even though he’s collared. Yes Kris; I imagine it would be quite a shock to pull off a beach-side road & meet a lion. Sometimes I think, Ian, you must be a hermit ordained to scour those godforsaken moonscapes. But I thank my fortunes to be able to tag along you through your mesmerizing posts. You have brought home the desolation of the deserts roamed by the solitary lion with amazing vividness.